Screen shot: I-Payout website showing logos of "Global Strategic Partners." Ponzi-forum reports surfaced yesterday that the Wealth4AllTeam HYIP scheme was using I-Payout. In July, a scheme known as "OneX' that federal prosecutors previously described as a fraud and a "pyramid" announced that it was transitioning to I-Payout. UPDATE: Wealth4AllTeam, one of the many HYIP schemes pushed by Zeek Rewards “I Got Paid” cheerleader “Ken Russo,” reportedly was using I-Payout as a payment facilitator, according to new Ponzi-forum reports. Earlier this year, Wealth4AllTeam planted the seed that it would sue the RealScam.com antifraud forum for publishing information unfriendly to Wealth4AllTeam. “I-payout quick links has been removed….all the attached bank account has been deactivated..there is no option left to deposit or withdraw…Looks like W4all have a hold on I-payout,” MoneyMakerGroup poster “jhakas22” claimed yesterday. If the report is true — and MoneyMakerGroup poster Tobwithu claimed that he (or she) “can confirm that all links at i-payout are gone!’ — then it means that Wealth4AllTeam was using the same facilitator to which the mysterious “OneX’ scheme claimed it was transitioning. In April, federal prosecutors described the purported OneX “program” as a “fraudulent scheme” and “pyramid” pushed by former AdSurfDaily President Andy Bowdoin. ASD was a $119 million Ponzi scheme. In August, Bowdoin was sentenced to 78 months in federal prison. On July 19, the PP Blog reported that OneX claimed it had dropped SolidTrustPay — a Canada-based processor linked to fraud scheme after fraud scheme — in favor of I-Payout. That announcement was made by “J.C.,” later identified by federal prosecutors as James C. Hill. 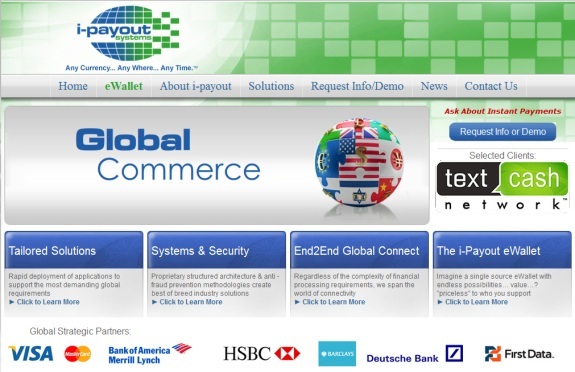 I-Payout’s website publishes the logos of HSBC, Deutsche Bank, Barclays and other “Global Strategic Partners,” including Bank of America. “J.C.” made the OneX I-Payout announcement on July 17, the same day the U.S. Senate Permanent Subcommittee on Investigations was grilling HSBC executives on HSBC’s anti-money-laundering practices, including an executive who announced his resignation in front of the panel. Any number of ASD Ponzi-scheme pushers used Bank of America’s name to sanitize the ASD fraud. In raising Bank of America’s name in June and announcing the I-Payout transition in July, OneX appears to have been doing the same thing. Name-dropping to sanitize fraud schemes is common in the HYIP sphere. So are lawsuit threats and other bids to chill websites that publish information critical of HYIPs. In July, Robert Craddock, a purported “consultant” for Rex Venture Group LLC — the operator of the Zeek Rewards MLM scheme — sought to have a HubPages site operated by Zeek critic “K. Chang” removed from the web by filing a complaint with HubPages about purported copyright and trademark infringement and libel. Craddock’s efforts succeeded temporarily. The Zeek post, attributed to then-acting COO Gregory J. Caldwell, complained the credit unions were slandering Zeek and warned Zeek members to toe the company line. Thirteen days later, the SEC filed an emergency court action that described Zeek as a $600 million Ponzi- and pyramid scheme. Craddock now is involved in a purported effort to defend Zeek affiliates from clawback actions by the court-appointed receiver in the SEC’s Zeek case. That effort began after the SEC’s actions against Zeek and also included name-dropping. During a pitch for Zeek members to send in money, Craddock dropped the name of former Florida Attorney General (and former U.S. Rep.) Bill McCollum. McCollum, now a partner at the SNR Denton law firm, no longer is in public office. Precisely why Craddock mentioned McCollum’s name is unclear, although Craddock initially said that the Zeek affiliates were hiring SNR Denton. That effort appears now to have fallen through. As Florida’s Attorney General, McCollum sued ASD for fraud in August 2008. Some ASD members countered that McCollum should be sued for Deceptive Trade Practices for holding the view that ASD was a fraud. Although McCollum’s office later dropped the ASD lawsuit, it said it had gathered names of ASD fraud victims and provided them to the U.S. Department of Justice, which had established a remissions process through which ASD victims could receive compensation from proceeds seized by the U.S. Secret Service in the ASD Ponzi case filed at the federal level in the District of Columbia. Zeek is known to have members in common with the ASD Ponzi scheme. Some Zeek members also promoted OneX, the scheme promoted by ASD’s Bowdoin after his December 2010 arrest by the U.S. Secret Service on Ponzi-related charges of wire fraud, securities fraud and selling unregistered securities.